Big and fast will defeat little and fast every day of the week. That synopsis is what happened in the first national championship game formulated by the newly created College Football Playoffs system. Big Ten champion Ohio State and its third-string quarterback took Heisman Trophy winner Marcus Mariota and Oregon to the woodshed in the school of physicality and came away victors in college football game’s finale, winning 42-20. The game wasn’t even that close.When was the last time you saw a team turn the ball over four times and still whip its opponent? The Buckeyes were too big, too strong and too physical for the small and speedy Ducks to handle. As Mariota and Oregon learned, being dressed up pretty in shining new uniforms does not translate into a winning the championship. The Buckeyes laid the groundwork on how to stop the Ducks, stuff that is pretty simple when you get to the core of the matter. All season long college football analysts talked about how fast the Ducks were and how difficult it was to slow college football’s hottest team down. Well, Monday night, that speed was slowed into a normal walk by Ohio State. By halftime, Ohio State taking a 21-10 lead into intermission, the body language of Oregon’s players said it all. There were gloom looks from the Ducks as they headed into the locker room as if they knew what was going to come down the pipeline. This game was supposed to be Mariota’s coronation as the greatest college quarterback to ever live if you believed that nonsense from ignorant-talking journalists and so-called football experts eager to anoint the junior quarterback and the Ducks as the best thing next to sliced bread. This was supposed to be the game where people around the country were expected to serenade the Ducks with some sort of mythical heroes’ welcome. 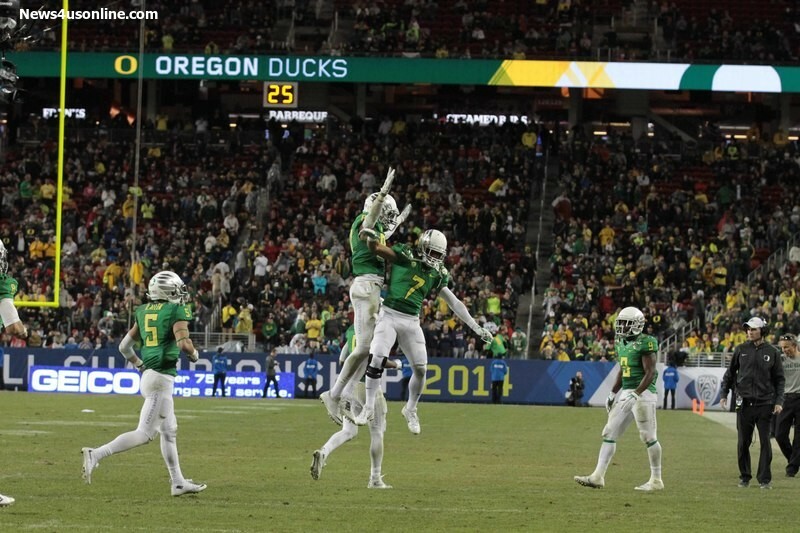 This game was going to be Oregon’s official breakout party. Ohio State and coach Urban Meyer had other things in mind: mainly pound the smaller Ducks into submission with their offensive and defensive line. That did the trick. 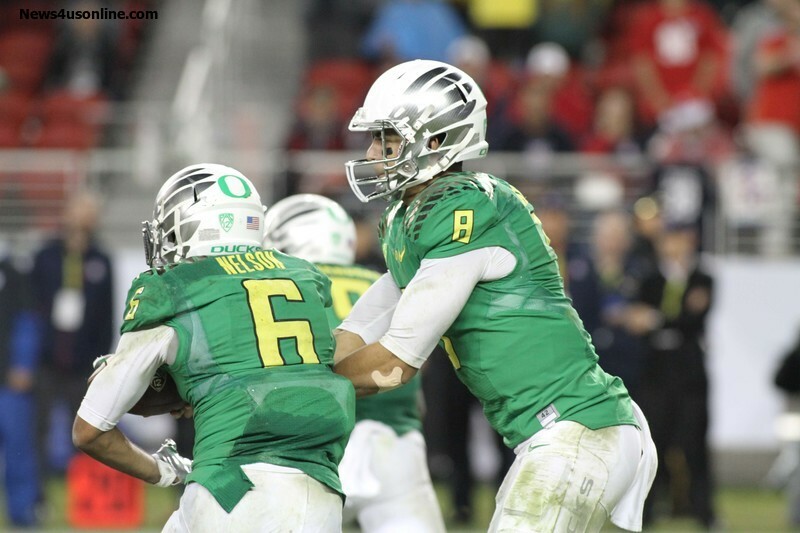 The Buckeyes figured out a formula to offset the explosive Ducks and contain Mariota. Mariota threw for over 300 yards, but those yards mostly felt empty and meaningless. Mariota needed to be special in order for Oregon to beat Ohio State the same way former Texas star quarterback Vince Young crushed Pete Carroll, Matt Leinhart, Reggie Bush and the rest of the USC Trojans in the Longhorns’ 41-38 win in the 2002 BCS National Championship game at the Rose Bowl. Instead, Ohio State made Mariota look very ordinary. The Buckeyes took the bubble screen play away from the Ducks at the start of the game and closed the gaps in the secondary to frustrate Mariota and Oregon’s wide receivers. They also didn’t allow Mariota to set up shop and become comfortable in the backfield whenever he did decide to complete a pass. On the other side of the ball, Oregon got hammered by Ohio State running back Ezekiel Elliott (246 yrds), who did whatever he wanted to against the Ducks. Oregon had no answer for the hard-charging Elliott. But they did have a strategy to take third-string quarterback Cardale Jones out of his game, perhaps even rattle him. As it turned out, Jones was the best quarterback on the field, rushing for a touchdown and passing for another score. Jones also produced the play of the game when he ran over a Oregon linebacker. That play pretty summed the entire flow of the game: Big and fast will always beat small and fast.